Representation of Painting has always been closely related to the representation of philosophy, the latter thinks that the direct object of knowledge is the conception of mind, rather than the actual external object. By analogy, the re-presentation of things in painting relates more directly to feelings, perception and conception rather than things themselves. However, when painting represents something,what we see is the illusion of the artists’ or our own ideas? Representation directs at the basic psychology and epistemology, the formation of visual image links with perception, emotion and memory. In Roger Scruton’s article “photography and representation”, he believes that painting is the expression of ideas, the intentional relation between painting and painted objects is exactly the core of representational art which is both cultural, ideological and formal, lingual. Scruton also points out the ideal characteristic of photography, that between photography and its objects there is only causal relations – the camera never plays a substantial role in any representational steps and its significance lies only in pointing to objects. Richter also holds the approximate point of view. Early in his notes between 1964 and 1965 , he wrote that “photographs reshape the object in a way that is different from painting because the camera does not understand the object: it only sees the object”. What is different is that Richter was more likely to affirm the representational way of photography and thereby examines the representative ways of painting resulting in changed styles from the old days. He attached importance to the mechanical imaging process of the camera which he thought was the truly objective “representation” of the real world. When Richter repeatedly stressed that he was drawing in the way of the camera “or “re-producing photography with painting “, he fell into the trap of philosophy: using photographic representation to confront the representation of painting so painting is just like using man’s power to fight against nature. Since the birth of the Daguerre photographic Act of 1839 until the early 20th century photography, this new kind of plane of visual art has always been trying to imitate painting. Until the dissolution of The American Photo-Secession in 1917, independent photographic art in the modern sense began its diversified development. However, when photography gradually became conscious enough to open up the possibility of an absolute objective representation, the representation of traditional painting suffered a comprehensive review of inspection and reflection which eventually resulted in modernist painting’s move towards expression and abstraction. In fact, the representations of the painting and photography have formed a relationship of learning which also work against each other from the beginning: If Jean Auguste Dominique Ingres was trying to grasp a body posture more quickly and accurately through the scientific eye of the camera to strengthen the aesthetic pursuit of classic painting in the pre-modern period, then Richter was meant to explore the spiritual connotation of the representation of painting by borrowing the representative way of photography. The material of the set of portraits “Forty-eight Portraits (1971-72) “was selected from photos of the celebrities from an old encyclopedia, in fact, alternative portraits of the celebrities in his ” collections of pictures ” were as many as 270, the final selection were of the cultural celebrities who were once world-famous but now forgotten, and on show, they were all mixed up and confused. Richter said that this group of paintings was a symbol of the fracture with tradition that cannot be repaired. Since the 1840s, many of the miniature portrait painters were diverted to become portrait photographers. The exposure time of portrait photography at this time was very long. In Benjamin’s opinion, it was the original metal printing method and the long exposure that made the sitters in portrait photography appear as if surrounded by an Aura which gives richness and serenity, portrait photography has become the last and the best “portraits”; After 1880, with the rapid development of the light sensing technology, a camera could blur out details just like a mirror, however, it has lost the Aura forever. 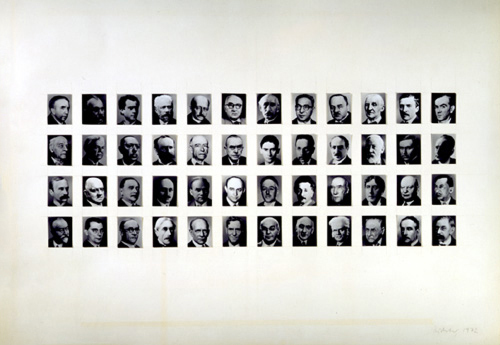 Most photos from the “Forty-eight portraits (1971-72) “are taken between the late 19th century and the early 20th century, they were exactly the first batch of photos that lost the Aura – a symbol of the cultural traditions of the portraits. In addition, these writers, musicians, scientists and philosophers were all living in the era of social transformation, as intellectuals, they worked to promote the formation of modern culture. If what Richter was concerned with is not traditional culture but modern culture which is interrupted by centralized dictatorship, then why didn’t he choose the most representative figures and arrange a sequence according to their cultural contribution? Richter apparently wanted to negate each person’s unique Aura, he drew them approximately: monochrome, same white shirts and collars of dark coats with no details being portrayed. The representative way of photography seems to have been realized by means of painting: being indifferent to otherness, remaining silent about value judgments. The forgotten intellectuals refer to cultural memory as that which has always been disrupted , the disordered arrangement is also a negative arrangement in the conscious, what Richter truly negates is direct value judgment and aspirations of pursuing significance . In “Forty-eight Portraits”, Richter represents photography as the way that photography mainly depicts ways of seeing with reference to attitude , what is most important is that he imitates the indifferent relationship between photography and its objects. However, what his attempts in choosing material and painting techniques explores is still the question of what and how does painting represent, photographic representation then plays the role of a path, that is the above-mentioned “the spiritual content of painting’s representation” which Richter called ” the ideal of strong realist works “- Stoll interpreted as ” His paintings are neither representing material objects nor the metaphysical spirit outside of painting”. It can be seen that Richter believed that the representative connotation of the realist painting, in fact, was most closely related to art history. The views expressed in this column are the author’s own and do not represent those of CAFA ART INFO. OCAT Shanghai presents "On Struggling to Remain Present When You Want to Disappear"